Upcoming briefings may be "rough"
Landowners near the Fukushima Daiichi nuclear plant have voiced frustration at the government’s plan to buy up their properties to build intermediate storage facilities for radioactive soil and other waste. About 150 people took part in an Environment Ministry briefing on Monday. It was the first in a series of sessions aimed at outlining compensation plans for landowners in Futaba and Okuma towns. The move comes as the Fukushima prefectural government earlier accepted construction of storage facilities in the 2 towns. Ministry officials said they plan to purchase land at around half of its value before the nuclear accident. The officials said compensation for housing would depend on the age of buildings. They said landowners who decline to sell but allow usage of their plots would be paid 70 percent of the purchase price. They said the prefecture would effectively cover the difference between the properties’ pre-disaster value and the amount of compensation. Many landowners expressed their reservations. A man from Futaba Town said the offered price fell short of what he expected, and that the officials spoke about the possibility of forcibly buying up land. He predicted that upcoming briefings would be rough. A woman from Okuma Town said government officials seemed to care little about the feelings of people who will be deprived of their land. The government wants to win landowners’ understanding, and start shipping contaminated waste to the storage facilities in January. This entry was posted in Uncategorized on September 30, 2014 by citizenperth. What is a hospital "designated" to treat radiation? The number of hospitals locally “designated” to treat radiation exposure has grown to 201 from 83 before the Fukushima nuclear disaster, a survey says. But the survey, conducted by Kyodo News, also showed that the so-called designated hospitals, as of August, were still struggling with shortages of skilled personnel and equipment as central government pushes to restart dozens of idled reactors, many of them old. The hospitals were designated by local governments as medical institutions that will provide emergency treatment for radiation exposure if nuclear accidents occur. But there are no requirements for receiving the designation — including number of doctors specialized in radiation treatment. This step was advised through a report compiled by the now-defunct Nuclear Safety Commission after the deadly 1999 criticality accident at a uranium-processing plant in the village of Tokai, Ibaraki Prefecture. The Nuclear Regulation Authority is reviewing medical preparedness for nuclear disasters as part of a package of initiatives introduced in response to the Fukushima nuclear disaster but has not hammered out any specifics. The survey was conducted from July to September, 15 years after the criticality accident at JCO Co. in Tokai on Sept. 30, 1999, which killed two people. Responses were received from all 24 prefectural governments selected for their proximity to nuclear facilities. TOKAI, IBARAKI PREF. – The Fukushima nuclear disaster reflects a failure by the government to learn from Japan’s first deadly nuclear accident 15 years ago in Tokai, Ibaraki Prefecture, according to the village’s former mayor. Speaking to around 350 people at a public meeting there Sunday, Tatsuya Murakami said the nation glossed over the Tokai disaster and upheld a “myth” about the safety of nuclear power. “Japan was caught up in a safety myth, that a serious nuclear accident would not happen in this country,” he said. The accident at a nuclear fuel reprocessing plant in the village occurred on Sept. 30, 1999. It left two people dead. He said the safety myth and failure to clarify exactly why the accident took place led to mistakes that resulted in the Fukushima debacle. The accident in Tokai, about 130 km northeast of Tokyo, killed two employees of operator JCO Co. and exposed more than 600 residents to radiation. The critical state lasted around 20 hours, through the next day. Six JCO employees and the company itself were faulted for the accident. Workers using buckets had poured too much uranium solution into a processing tank, which led to a nuclear fission chain reaction. Focusing on the use of buckets and calling it “an unexpected problem,” the government and the nuclear industry placed the responsibility for the accident solely on JCO. Murakami stepped down as mayor a year ago after 16 years in office and now works as a co-representative of Mayors for a Nuclear Free Japan, a body that comprises nearly 100 former and current mayors who campaign to phase out nuclear power. When the Tokai accident occurred, the local and central governments seemed unable to take the lead in responding. Murakami stepped in, taking a unilateral decision to evacuate residents within 350 meters of the JCO compound. After the Fukushima disaster, the then-government of the Democratic Party of Japan declared that the nation would aim to phase out nuclear power by 2040. But the current government, under Prime Minister Shinzo Abe of the Liberal Democratic Party, decided this year to support the continued use of nuclear power and upheld commitment to the nation’s spent-fuel recycling projects. Another speaker addressing the meeting was Keiko Oizumi, a former worker at a factory near the JCO plant. She and her husband filed for compensation against JCO and parent company Sumitomo Mining Co. for damage to their health, but in 2010 the Supreme Court threw the case out. 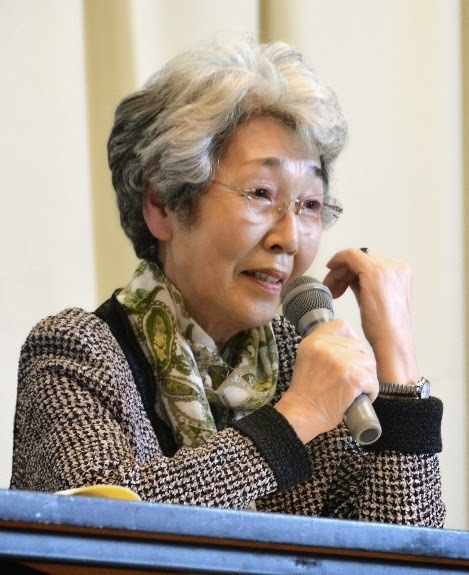 Oizumi spoke of how she sometimes gets to meet evacuees from Fukushima. She also described how she still sees mental-health specialists. She said she feels the pain of Fukushima evacuees as her own. “People do not bleed if they are exposed to radiation, but they bleed in their hearts,” she said. Oizumi urged supporters to take their demands to those in power. It was all over within hours certainly by 19th March, no power, no cooling, no containment. “Not for Distribution, Internal Use Only”: US Energy Dept. estimated Fukushima release up to 10,000 times larger than nuclear regulators predicted — ‘Supercore’ scenario an underestimate? Can Occupiers of Anti-Nuke Tent Village Break Down METI of Japan? Will Fukushima Become An Extinction Level Event? Thinking of Purchasing a Geiger Counter? Fukushima radioactive contamination is rapidly warming North Pacific seawater. Japanese right targets liberal media A campaign of intimidation has been launched against Japan’s major liberal and moderate media outlets. Is the Asahi a scapegoat of nationalist media or victim of own missteps? Why is there no international effort to contain Fukushima’s nuclear mess? 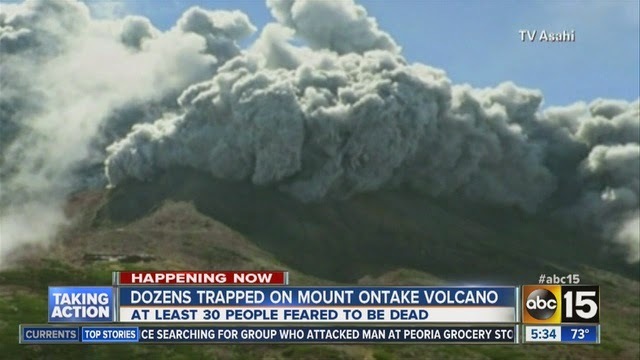 Saturday’s eruption of Mount Ontake is likely to set back plans to restart nuclear reactors in Kagoshima Prefecture and possibly elsewhere, as local governments and residents start debating how safe the plants would be in the event of a nearby volcanic eruption. Concern is especially high in Kagoshima, home to 11 volcanos classified as active by the Meteorological Agency. From January to March 2011, eruptions at Shintoïsme, part of the Mount Kirishima chain, closed four railroad lines and forced the evacuation of hundreds of residents. Last month, the Nuclear Regulatory Authority signed off on the safety of reactors 1 and 2 at Kyushu Electric Power Co.’s Sendai plant in Satsumasendai, Kagoshima Prefecture, a major step toward their planned restart. The decision came after months of concern in Kagoshima about what would happen to the plant in the event of a volcanic eruption, but Kyushu Electric says Mount Ontake will not change its plans for Sendai. “The scale of the eruption at Mount Ontake was small, whereas in our safety measures we looked at the possibility of large eruptions. So we don’t think there will be any effect on the plans to restart the Sendai reactors,” Kyushu Electric spokesman Yuki Hirano said Tuesday. But pressure on the utility and pro-nuclear politicians in both Kagoshima and Tokyo to delay, or halt, the road to a Sendai restart is growing. On Sunday, organizers said an estimated 7,500 people gathered in the city of Kagoshima to protest the restart of the Sendai reactors, the largest demonstration of its kind the prefecture has ever seen. “Concern about what would happen to the Sendai reactors in the case of a volcanic eruption is growing rapidly in the wake of the Ontake eruption,” said Yoshitaka Mukohara, head of Antinuclear Kagoshima Network. Ardent pro-nuclear Kagoshima Gov. 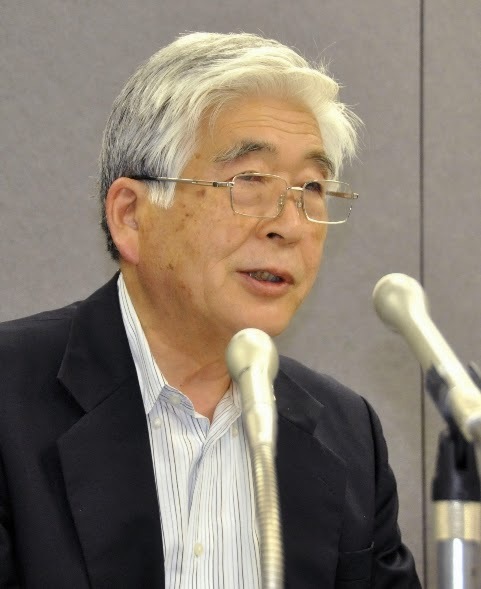 Yuichiro Ito has said the only two local government heads that need to agree to a restart of the reactors are himself and Satsumasendai Mayor Hideo Iwakiri, a strong advocate of turning the reactors back on. Since 1974, Satsumasendai, a city of about 100,000 people, has received more than ¥23 billion in nuclear power subsidies. But a rush by Ito to restart the reactors could prove politically difficult. There are nine other cities within 30 km of the nuclear plant, and some of them are opposed. Ichikikushikino, a city of 31,000 residents 10 km from the plant and where opposition to the restart is strong, passed a resolution Tuesday calling on Ito to seek the agreement of local governments around the plant, especially those within 30 km of the reactors. This report summarizes the status of nuclear fuel stored at the Fukushima Daiichi (F1) and Fukushima Daini (F2) nuclear power plants. (*1) Calculated value (ton) from number of fuel assemblies. (*2) Total number of fuel assemblies is 1,535, including 204 new fuel assemblies, as of March 11, 2011, since two new fuel assemblies were removed on 2012/7/18-19. (*3) Including two new fuel assemblies removed from the F1-4 spent fuel pool. (*4) All fuel assemblies in the reactor transferred to spent fuel pool in October 2012. 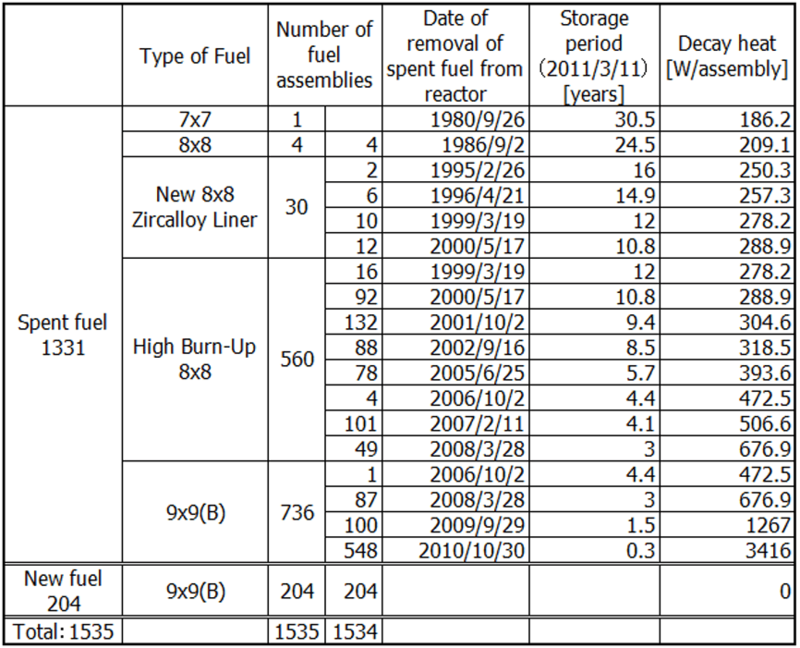 Table 1 lists the data for the nuclear fuel loaded (melted down) in the reactors and fuel stored in the fuel pools in the individual reactor buildings of the F1 and F2 plants as of January 31, 2013. The fuel from F1 Unit 4 reactor had been entirely unloaded for shroud replacement work. 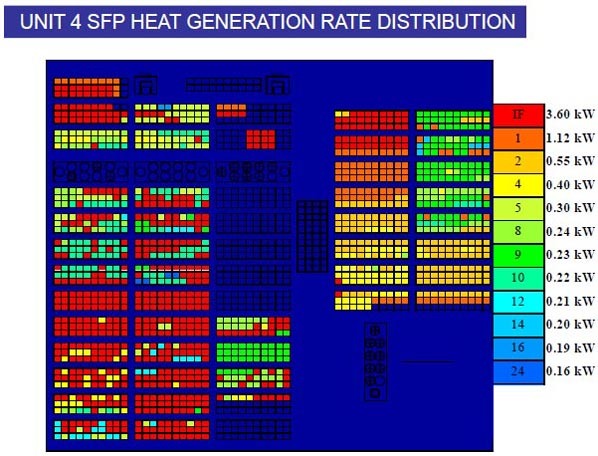 The removed fuel was in the spent fuel pool (SFP), in which as many as 1,535 fuel assemblies, including new fuel assemblies, were stored, generating a great amount of heat (Table 2). All the fuel in the F2 Unit 4 reactor was unloaded and placed into the F2 Unit 4 SFP in October 2012. Since a hydrogen explosion occurred in the upper part of the F1 Unit 4 building on March 15, 2011, a large amount of debris fell down onto the pool. There is strong concern both in Japan and overseas about the integrity of the fuel assemblies and Unit 4 building. Tokyo Electric Power Company (TEPCO) reinforced the lower part of the SFP with rigid supports and concrete walls. The company has stated repeatedly that “The pool is sufficiently quakeproof and will resist an earthquake as great as the 2011 Earthquake off the Pacific Coast of Tohoku” (intensity 6 plus). This explanation has no scientific grounds. A detailed diagram of the fuel assembly configuration in the F1 Unit 4 SFP is available on the Internet (Fig. 2). TEPCO plans to begin the work of removing fuel from the F1 Unit 4 SFP in mid-November, 2013, and to complete the work about one year later, at the end of 2014. To ensure the feasibility of the removal work, the power company transferred two new fuel assemblies from the SFP to the common pool, inspected them, and reported that they were free from corrosion and deformation. However, this is far too hasty a conclusion, since great volumes of seawater were poured into the SFP and because only two fresh fuel assemblies were inspected, not spent fuel assemblies. Because the original fuel crane and other facilities of F1 Unit 4 were destroyed in the hydrogen explosion, TEPCO plans to transfer the fuel from the SFP after removing the fifth floor of the reactor building. All the debris will then be cleared off the SFP and a structure named a fuel removal cover will be installed next to the building. The structure is planned to stand 53 meters above ground, measure about 69 meters north–south, and about 31 meters east–west (Fig. 1). According to TEPCO, the structure of the cover supporting the crane is designed so as not to place any load on the reactor building. Nevertheless, the quake resistance of the cover will not be sufficient. It is planned to transfer the removed fuel assemblies to the common pool by means of two shipping casks (model NFT-22B), which have a capacity of up to 22 assemblies. A total of 6,375 nuclear fuel assemblies are currently stored in the F1 common pool. The pool is expected to accept a total of 3,108 fuel assemblies from the SFPs of F1 Units 1 to 4 in the future. As Table 1 shows, however, the common pool has almost no extra capacity (it is about 93% full). Accordingly, about half the fuel assemblies currently in the common pool are expected to be transferred to temporary dry cask storage facilities, explained below, to provide capacity for the fuel assemblies being transferred from the SFPs. These fuel assemblies include those whose storage is not included in the construction permit of the common pool, such as spent fuel (7×7 fuel assemblies), fresh fuel (9×9 fuel assemblies), and damaged fuel, as well as almost all the variations of boiling-water reactor fuel assemblies, as shown in Table 2. The fuel assemblies being transferred from the SFPs to the common pool are assumed to be damaged or contaminated with salt, and common pool renovation is planned to maintain water quality. Reproduced from “DOE Response to Fukushima Dai-ichi Accident,” by John E. Kelly, May 26, 2011, available at http://pbadupws.nrc.gov/docs/ML1114/ML11147A075.pdf (page 188/210). TEPCO provided this configuration to the US Department of Energy (DOE), but to date has not published it in Japan. The F1 plant is equipped with a facility to store spent fuel assemblies in dry casks. A total of 408 spent fuel assemblies are stored in the facility, in four middle-sized casks (each storing 37 assemblies) and five large casks (each storing 52 assemblies). The facility is located near the ocean and is assumed to have been partially inundated in the earthquake and subsequent tsunami on March 11, 2011. The integrity of the stored fuel will be investigated at some point in the future. The facility is severely damaged inside, and the monitoring instruments, such as thermometers, and the ceiling crane are out of order. “The facility is no longer useable,” says TEPCO. The casks are due to be transferred. 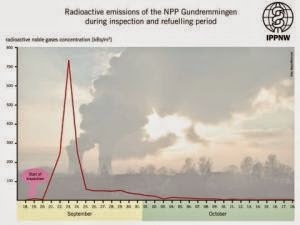 A radioactive emissions spike taking place during refueling from fugitive noble gas release at the Gundremmigen nuclear plant, Bavaria, Germany. Measured as kBq/m3 against time, in half-hourly intervals. Graph: Alfred Korblein. When nuclear reactors are refueled, a 12-hour spike in radioactive emissions exposes local people to levels of radioactivity up to 500 times greater than during normal operation, writes Ian Fairlie. The spikes may explain infant leukemia increases near nuclear plants – but operators provide no warnings and take no measures to reduce exposures. Operating nuclear power plants (NPPs) contain large volumes of radioactive gases at high pressures and temperatures. When their reactors are depressurised and opened to refuel every 12-18 months, these gases escape creating a spiked emission and a large radioactive plume downwind of the station lasting for 12 hours or so. However the emissions and plumes are invisible, and no advance warning is ever given of these spikes. The public is effectively kept in the dark about them, despite their possible health dangers. For years, I had tried to obtain data on these spikes, but ever since the start of the nuclear era back in 1956, governments and nuclear power operators have been extremely loath to divulge this data. Only annual emissions are made public and these effectively disguise the spikes. No data is ever given on daily or hourly emissions. Is this important? Yes: these spikes could help answer a question which has puzzled the public and radiation protection agencies for decades – the reason for the large increases in childhood leukemias near NPPs all over the world. Governments have insisted that these increased leukemias could not be caused by radioactive emissions from NPPs as their estimated radiation doses were ~1,000 times too low. But these don’t take the time patterns of radioactive emissions into account, and so are riddled with uncertainties. This situation lasted until September 2011, when the International Physicians for the Prevention of Nuclear War (IPPNW) in Germany released a press notice. For the very first time anywhere in the world, half-hourly data on releases of radioactive noble gases from an NPP were made public. This is shown in the chart (above right) below for 7 days in September 2011. These data were from Gundremmingen NPP -in Bavaria, Southern Germany. The chart showed that the normal emission concentration (of noble gases) during the rest of the year was about 3 kBq/m³ (see squiggly line along the bottom on September 19 and 20) , but during refuelling on September 22 and 23 this sharply increased to ~700 kBq/m³ with a peak of 1,470 kBq/m³: in other words, a spike. Primarily, the spike includes radioactive noble gases and hydrogen-3 (tritium) and smaller amounts of carbon-14 and iodine-131. This data shows that NPPs emit much larger amounts of radioactive noble gases during refuelling than during normal operation in the rest of the year. From the new data, Nuremberg physicist and statistician, Dr Alfred Körblein, has estimated that, at its maximum value, the concentration of noble gas emissions during refueling was 500 times greater than during normal reactor operation. He also has estimated that about two thirds of the NPP’s annual emissions occur during refuelling. In May 2011 in Germany, Green MPs entered the Bavarian State Parliament (Landtag) for the first time where they formed the Government in coalition with the German Socialist Party (SPD). After several requests, the new Bavarian Government insisted that the state nuclear regulator release non-averaged data on emissions. The highly reluctant nuclear regulator was compelled to respond. In other words, the Green MPs obtained the data because they had the political power to force its release: there is a lesson here for British environmentalists. So could these spikes help explain leukemia increases near nuclear plants? Yes they could. People living near nuclear power stations and downwind from them will be exposed to high doses of radiation during these emissions spikes – estimated to be 20-100 times higher than from the tiny releases during the rest of the year. An older German study (Hinrichsen, 2001) indicated that these doses could be 100 times greater. (Hinrichsen K (2001) Critical appraisal of the meteorological basis used in General Administrative Regulations (re dispersion coefficients for airborne releases of NPPs) See Annex D page 9: Radiation Biological Opinion (in German). Some scientists think that the time pattern is unimportant and only the population dose is relevant, but this turns out not to be the case. The reason is partly related to the duration of the release, as short releases produce very narrow plumes (plume widths vary non-linearly as a fractional power of the duration). The result is that individual doses increase dramatically per Bq emitted. Another reason is that spikes result in high concentrations of organically bound tritium and carbon-14 in environmental materials and humans which have longer retentions and thus higher doses. The precise amount will depend on many factors, including source term, proximity to the reactor, wind speed, wind direction, and the diets and habits of local people. Even before the new data, official sources didn’t have a good handle on these doses to local people. Official estimates of radiation doses from NPPs already contain many uncertainties, that is, they could be many times larger than admitted. This was shown in the 2004 CERRIE Report, a UK Government Committee which showed that dose estimates from environmental releases depended on many computer models and the assumptions they contained. The new information on radioactive spikes adds to these uncertainties. Therefore higher doses from emission spikes could go a long way to explaining the increased incidences of child leukemias near NPPs shown by the KiKK findings. “Especially at risk are unborn children. When reactors are open and releasing gases, pregnant women can incorporate much higher concentrations of radionuclides than at other times, mainly via respiration. Radioactive isotopes inhaled by the mother can reach the unborn child via blood with the result that the embryo/ fetus is contaminated by radioactive isotopes. In the light of the German data, it is recommended half-hourly emissions data from all UK reactors should be disclosed and that the issue of childhood cancer increases near NPPs be re-examined by the Government. Nuclear operators should inform local people when they intend to open up their reactors, and they should only do so at night-time (when most people are indoors) and when the winds are blowing out to sea. Dr Ian Fairlie is an independent consultant on radioactivity in the environment. He has a degree in radiation biology from Bart’s Hospital in London and his doctoral studies at Imperial College in London and Princeton University in the US concerned the radiological hazards of nuclear fuel reprocessing. Ian was formerly a DEFRA civil servant on radiation risks from nuclear power stations. From 2000 to 2004, he was head of the Secretariat to the UK Government’s CERRIE Committee on internal radiation risks. Since retiring from Government service, he has acted as consultant to the European Parliament, local and regional governments, environmental NGOs, and private individuals.